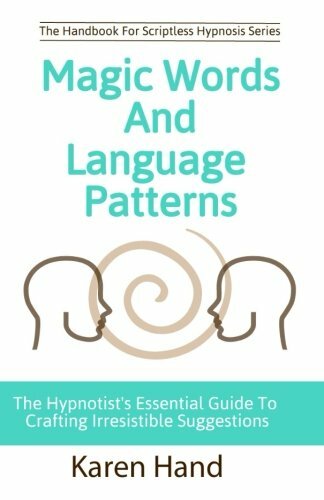 Magic Words and Language Patterns is a powerful, highly useful book, the first in the SCRIPTLESS HYPNOSIS HANDBOOK series. Hypnotists of all levels of experience will be able to expand their skills to new heights to create the most effective sessions and the most profitable practices. “Magic Words teaches you how to work without scripts, spontaneously and effortlessly in hypnosis and in your life.” ~Michael Watson, International Hypnosis and NLP Trainer and Past President Hypnosis Education Association “Any serious hypnotist or therapist MUST read this book if they want to increase their influence and help more people.” ~Dr. William Horton, author of The Secret Psychology of Persuasion “Magic Words is a must read for anyone who wants to really motivate themselves or others.” ~Shelley Stockwell-Nicholas, PhD President- International Hypnosis Federation “This is a wonderful handbook for all Certified Instructors to offer their hypnosis students. Karen expertly anchors skills as she teaches the concepts.” ~Larry Garrett BCH, OB Owner Garrett Hypnosis and Wellness Center “This book is captivating! ~Erika Flint, CEO Cascade Hypnosis Center Karen Hand, an award-winning Board Certified Hypnotist, Educator and World-Class Communicator, has helped thousands of people take control of their lives and trained countless hypnotists to help others make a change for good. Visit www.karenhand.com. View More In Health, Fitness & Dieting. If you have any questions about this product by ReMind Publishing, contact us by completing and submitting the form below. If you are looking for a specif part number, please include it with your message.